I've made several planters out of pieces of Styrofoam, which is used for protecting small appliances or electronics during transit. Once you unpack your blender or stereo, what do you do with the odd shaped pieces of Styrofoam (which are not really recyclable and some landfills won't accept them)? This project uses those weirdly shaped packing pieces so you don't have to worry about ruining the planet. 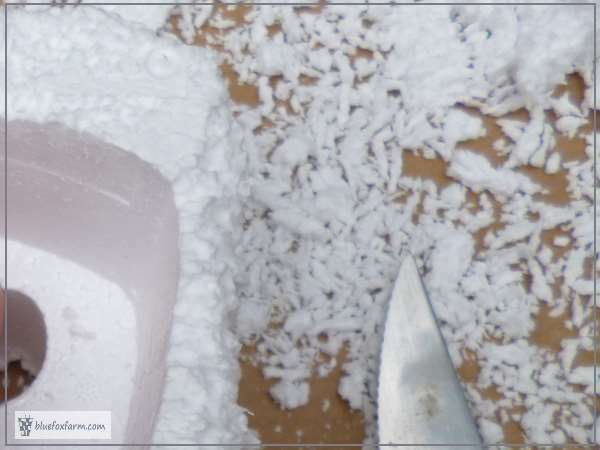 Use them for planting your hardy succulents in instead - the Styrofoam protects the roots, and gives them that little bit of insulation they need. 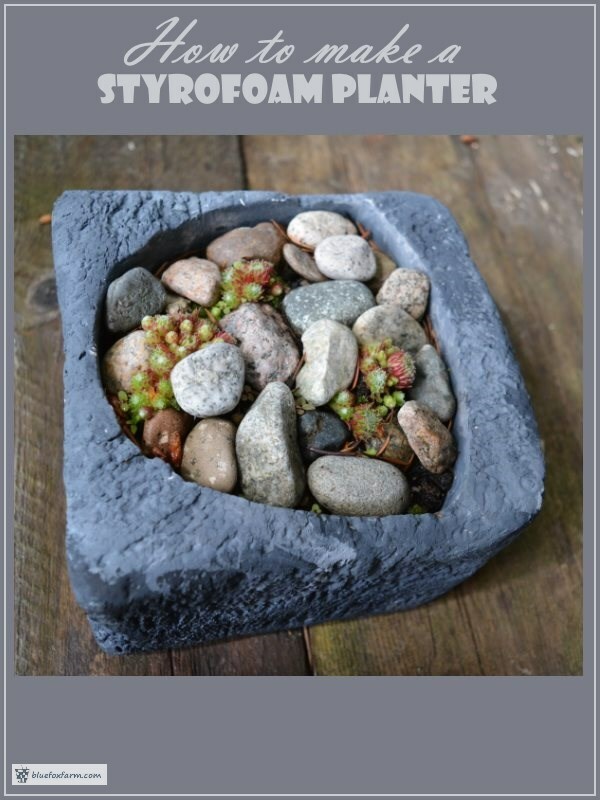 I hang onto them and make them into fabulous and interesting planters for succulents or moss gardens. 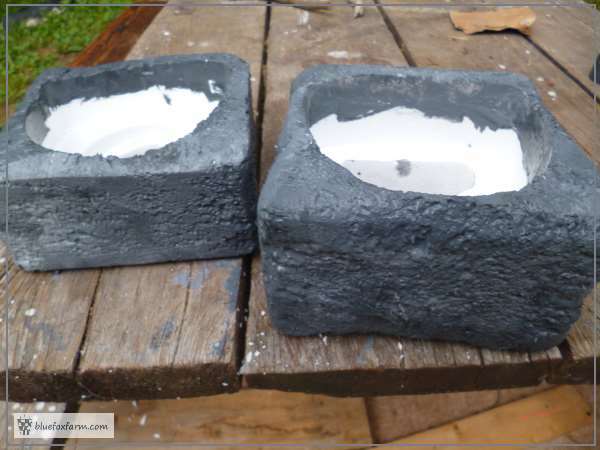 They are easy to make, with just a few simple supplies, like a sharp exacto knife, a bit of porch enamel and in some cases, a bit of screen to place over holes that are too big. 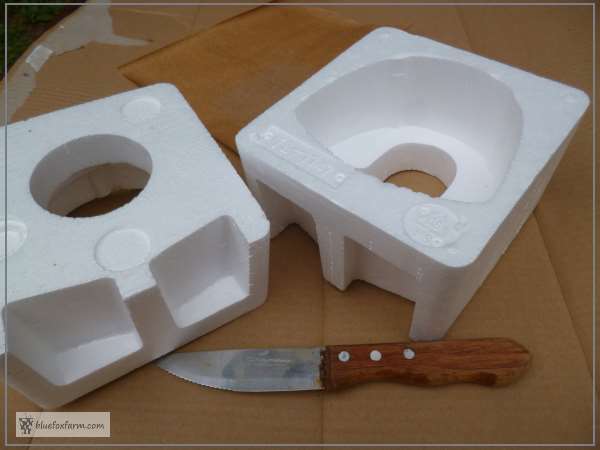 The shapes of the Styrofoam packaging are in strange shapes, so look at them to see if you can enlarge a cavity or somehow make it into something that can hold a plant or two. I discovered this old kitchen knife with a serrated edge, which cuts pieces off the Styrofoam, and also scrapes to take off the smoothness of the finish. You want the texture to be rough, so it looks like rock or hypertufa when you're done. Now to paint it! Styrofoam is a strange material. It holds the paint very well, which you wouldn't expect. The pores need to be sealed, especially where you've broken or cut them, with the knife. I use Porch and Floor Acrylic Enamel paint for a first coat, and let that dry completely. The second and third coats are usually partial coats using plain old Acrylic Craft Paint. In some cases, for smaller holes I use insect screen. 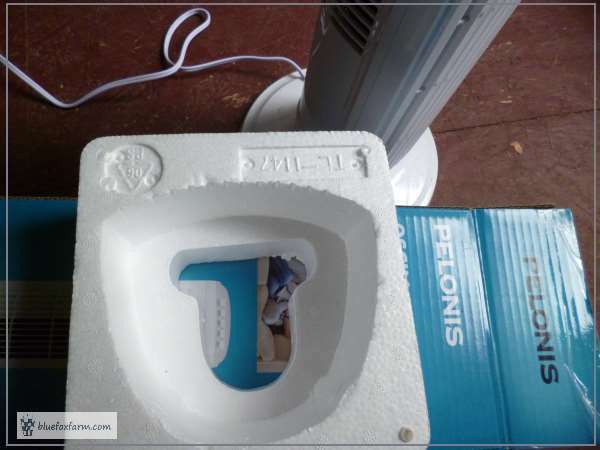 These show screen that is used for attic air circulation, or you can use hardware cloth. 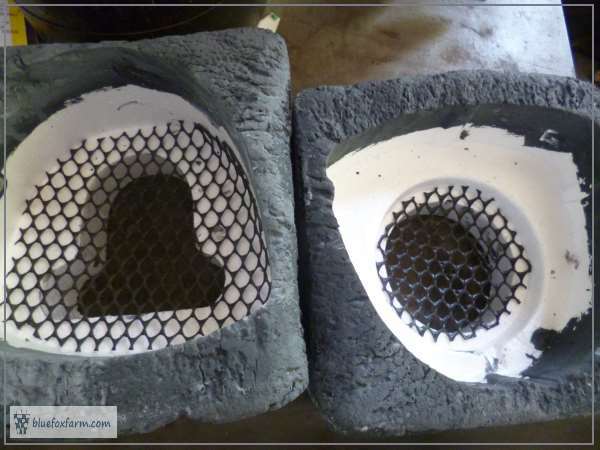 For larger holes such as these, something stiffer so it holds in place is best, or use some wire to make a hammock for the screen. The piece then has to be scraped with the side of a knife, or a rasp. 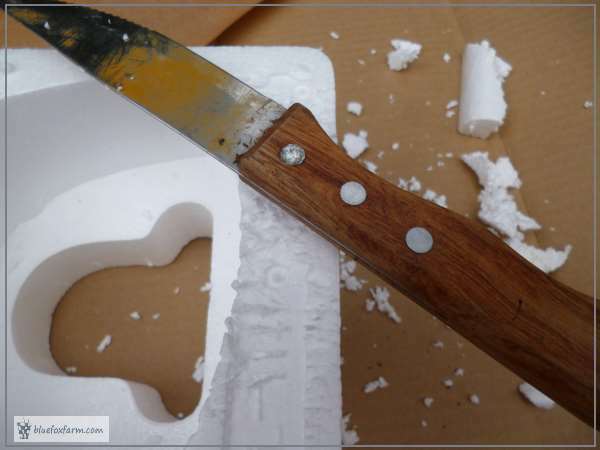 I use an old serrated cutting knife to give the styrofoam some character, and get rid of the smooth finish and square edges. I want it to look like a piece of tufa rock, or Hypertufa. 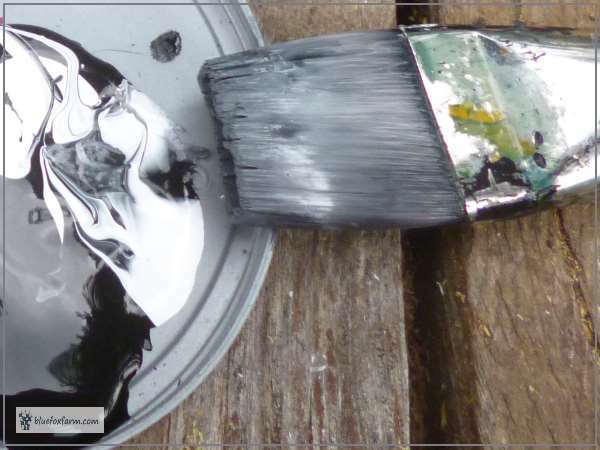 Then I paint it with one coat of the porch and floor enamel - I usually have a can of this on hand, in a grey color, just because it's such a good base for painting with acrylic craft paints, which is the next step. If it needs it because the hole is too big to hold soil, I cut some window screen to fit - sometimes you'll need to poke pieces of wire to hold it in place. Don't forget you'll have the weight of soil and plants on top of it.